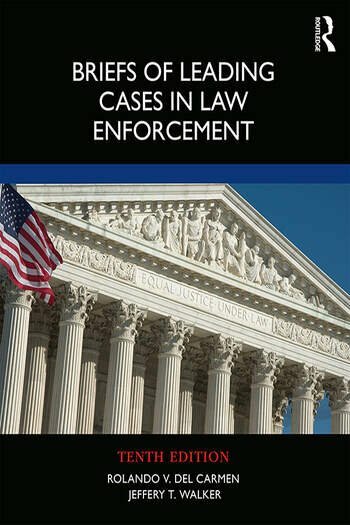 Briefs of Leading Cases in Law Enforcement, Tenth Edition, offers extensive updates on the leading Supreme Court cases impacting law enforcement in the United States, creating a must-have reference for police officers to stay up-to-date and have a strong understanding of the law and their function within it. All cases are briefed in a common format to allow for comparisons among cases and include facts, relevant issues, and the Court’s decision and reasoning. The significance of each case is also explained, making clear its impact on citizens and law enforcement. The book provides students and practitioners with historical and social context for their role in criminal justice and the legal guidelines that should be followed in day-to-day policing activities. 17. What Constitutes Interrogation for Miranda Purposes? Rolando V. del Carmen retired in May 2011 as Distinguished Professor of Criminal Justice (Law) in the College of Criminal Justice, Sam Houston State University. He has authored numerous books and articles in various areas of law related to criminal justice. He has won all three major awards given by the Academy of Criminal Justice Sciences, has taught numerous graduate and undergraduate classes in law, and has been a mentor and friend to many of his students. And he is terribly missed by all who knew him. Jeffery T. Walker is a professor and Chair of the Department of Criminal Justice at the University of Alabama, Birmingham. Dr. Walker has written 10 books and almost 100 journal articles and book chapters. He has obtained over $15 million in grants from the Department of Justice, National Institute of Drug Abuse, National Science Foundation, Center for Disease Control, and others. His areas of interest are social/environmental factors of neighborhoods, legal issues of policing, and crime mapping/crime analysis. He is a past President of the Academy of Criminal Justice Sciences. Editorial experience includes service as Editor of the Journal of Criminal Justice Education. Previous publications include articles in Justice Quarterly, and Journal of Quantitative Criminology, and the books Legal Guide to Policing (11th Edition) and Foundations of Crime Analysis. Walker also served as a Special Agent with the Air Force Office of Special Investigations (AFOSI), conducting major felony crime investigations. In September 2001, he was mobilized to provide counterintelligence, protective services, and force protection support to military personnel in U.S. and overseas locations. His final assignment was Superintendent of Counterintelligence Investigations at Headquarters/AFOSI in Washington, D.C.